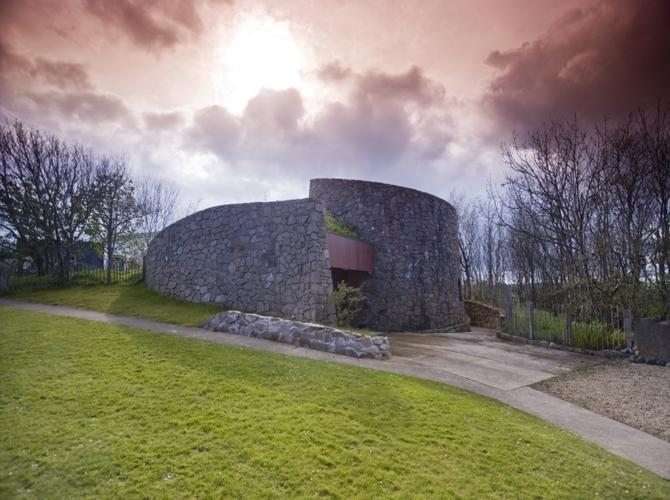 An Croi, which translates from Irish as “the heart”, is the Community’s pivotal focus: an inter-denominational centre for worship, designed by Gordon McKnight Architects, and erected in 1979 (opened June 1979). Its design and built form are both practically and symbolically a response to the contemporary political, social and religious context of Northern Ireland in the Troubles, forming an ecumenical, non-hierarchical, neutral yet spiritual space for contemplation, discussion and worship. Set into the hillside, the free-form building is built of locally quarried stone on a shell-like plan, and consists of three interconnecting spaces: a reception area, a large worship room and a small, circular second, intimate worship space of curved walls and domed roof with a hidden clerestory. The building’s architect, Norman Hawthorne of the Gordon McKnight practice, said that his attempt was to make the building become landscape combined with obvious quotations from some of the most ancient Christian sources, for example Skellig Michael off the coast of Co. Kerry. The Corrymeela Community was established by Ray Davey and others from a wide range of backgrounds in 1964 in order to be an “open village” of people from varying Christian traditions to learn from each other and work together ecumenically. Following the start of the Troubles in 1969, it specifically sought to act as a centre for community reconciliation and rehabilitation for those affected adversely by intimidation, injury and bereavement. It continues to provide a focus for cross-community initiatives in its residential setting on its striking hillside site overlooking the sea outside Ballycastle, Co. Antrim. The Corrymeela Centre is located on the north east coast of County Antrim, with views over a turbulent rocky coastline and within sight of the Mull of Kintyre. Croi is the Gaelic word for heart and is reflected in the buildings design. It comprises of several different chambers all flowing into each other. It is used as a worship centre, conference hall and theatre.